Erica Weems of Malakoff, TX, was the Womens State Champion. Erica is now a four-time State Champion! (Way to go Ms. Weems!) 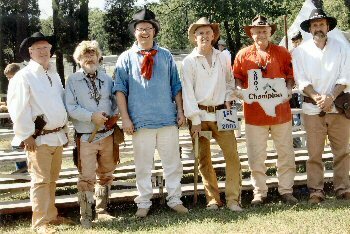 Bob Pyle of Brownsboro, TX, was the Mens State Champion and Bob also recently won the World Title in the Knife Competition at the World Championships in Claremore, OK.
From left to right are David Quinn, Roy Neal, John Goldsmith, Johnny Poole, Bob Pyle and Pat Minter. From left to right are Judy White, Laura Smith, Erica Weems, Anna Poole and Patsy Weems. 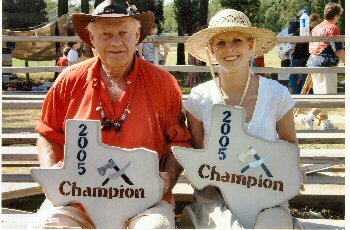 A new record of 44 competitors competed April 30th and May 1st, at the Texas State Knife and Tomahawk Championships held in Malakoff City Park. Congratulations to all participants and thanks to everyone for their support! 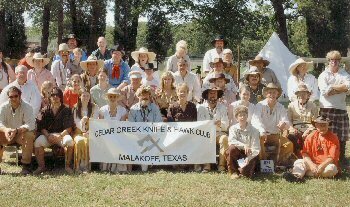 The Texas State Knife and Tomahawk Championships will be held April 30th and May 1st, 2005 in Malakoff, TX. Cash prizes awarded in PRO division for Men and Women. Prizes for AMATEUR and JUNIOR divisions also awarded. And BONUS awards for overall aggregate both Men and Women. This will be the largest event of its kind in the country. Most cash, most prizes, and most competition! Competition open for public viewing. Matches start at 9am Sat. and Sun. Located in Malakoff City Park on Hwy 198 North behind the Community Center. Late Registration 8am, Saturday 30th, you must be registered by 8:30am! Large On Site Primitive Camping Area Available - NO FEE! Traders Welcome. Set Up Anytime on Friday the 29th - NO FEE! 1) Safety is the number 1 rule! All contestants will throw in a safe manner. Anyone throwing in an unsafe manner will be asked to leave. 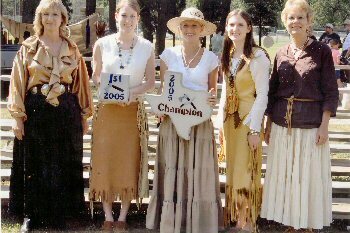 2) All contestants must be in primitive Pre 1840 dress to compete. 3) Absolutely no one is allowed on the range at any time unless an authorized range officer is present. 5) All youths 12 and under must be accompanied by parent or guardian. 6) Only competitors inside the competition area. 7) Coaching is permitted, but no physical contact may be made with the competitor or equipment. 8) Tomahawk must have no more than a single 4" cutting edge, measured along the curve, and must have a minimum cutting edge of 2". Tomahawks will have a separate head and handle. Handles must be made of wood, no taped handles, only natural material. No spike or double bit tomahawks. 9) Knife must be of traditional, useable type with at least one edge sharpened to the hilt. 10) Knife must have handle other than blade stock, handle must be thicker than the blade and be of natural material (leather, horn, antler, bone or rawhide). 11) Knives will not have a blade more than 2 1/2" at its widest point. 12) Point of knife must be stuck in the face of the block or it will be a zero score. 13) All knives should be of sufficient weight and size to throw safely with a minimum of rebound. This is left to the discretion of the range officer. Knives will be thrown by the handle only. 14) Must use same knife and hawk for each throw per event. 15) Knives and hawks must remain in the blocks until the judge has scored the throw. 16) It is the responsibility of the competitors to see that his or her knife, tomahawk, and primitive dress meet approval prior to the contest. 17) Scoring judge will have the final ruling. Contestants may ask for a second judges ruling. 18) Scoring will be aggregate per event. All contestants must be registered prior to competition. 19) Ties are broken at throw-offs at the close of the competition. The loser moves into the next lesser position. Anyone not present for throw-offs loses. If both parties are not present, the tie will be broken with a coin toss by the range officer. 20) Rules are subject to change by the booshway or range officer as they may deem necessary. HAVE A GOOD TIME AND BE SAFE!!! Booshways, Cedar Creek Knife and Hawk Club, or city of Malakoff, not responsible for accidents or theft. Each thrower and trader must sign a waiver of liabilty form to participate.